— the Muttahida Majlis-i-Amal and the Alliance for the Restoration of Democracy. The Muttahida Majlis-e-Amal, a conglomerate of four religious parties in Pakistan, has decided to move the country's Supreme Court against President Pervez Musharraf's announcement that foreign students studying at Pakistani seminaries will be identified and expelled soon. Six more people were arrested in two police raids south of London today in connection with the July 21 bombings in the British capital, police said. 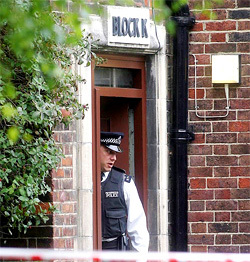 A police officer looks out from the entrance to Block K on the Peabody estate in Dalgarno Gardens, following arrests at the property in connection with bomb attacks on the city, in west London on Sunday. Hussain Osman, arrested in Rome on charges of taking part in the failed July 21 terror attacks in London, has claimed the plot was inspired by Britain’s involvement in Iraq war and denied any Al-Qaida link. CHILDREN as young as 11 are being targeted by radical Muslims who appear to have infiltrated a mainstream Muslim website, The Independent on Sunday can reveal. A car bomb exploded at an Iraqi police checkpoint south of Baghdad today, killing seven persons and wounding 12, the police said. The attack occurred around 50 km south of Baghdad, near the town of Haswa, the police department here said. Some fresh overtures have been made to forge a grand Opposition alliance between two major Opposition blocs — the Muttahida Majlis-i-Amal (MMA) and the Alliance for the Restoration of Democracy (ARD). The Vice-President of PML-Nawaz, Syed Zafar Ali Shah, held a 45-minute meeting on Saturday with the acting Secretary-General of MMA, Hafiz Hussain Ahmed, and stressed the need for expanding political talks on forging a possible “grand alliance” of the Opposition. Mr Shah told the MMA leader that the party had already received directives from its leader to go ahead with the plan. Mr Shah said that the party’s Secretary-General, Zafar Iqbal Jhagra, had also been summoned to Jeddah for further instructions. Earlier, the MMA in its meeting in Islamabad last Wednesday had decided to take along all other Opposition parties into confidence before going for a ‘‘decisive’’ movement against General Pervez Musharraf. Talking to Dawn, Hafiz Hussain Ahmed said that he had told the PML-N leader during talks that it was the PPP parliamentarians that had caused a setback to the earlier understanding between the two groupings. He recalled his meeting with PPP parliamentarians’ Chairperson Benazir Bhutto in Dubai in which PML-N Chairman Raja Zafarul Haq also took part. In the meeting both sides had agreed to take steps to forge an alliance on a minimum-point agenda. He said he also recounted the earlier high-level meetings between top leaders of the two alliances in which both had agreed to forge a united Opposition front on a three-point agenda. Further elaborating, he said both alliances had decided to launch a campaign against the government and remove Gen Musharraf as President and Chief of Army Staff, to restore the 1973 Constitution as it stood on October 12, 1999, and appoint of an independent poll commission for holding free, fair and transparent elections. PML-N will convene an important meeting in Islamabad to discuss its talks with the MMA so far and chart its future course on its relations with the alliance if the talks on a grand Opposition alliance collapse. The Muttahida Majlis-e-Amal (MMA), a conglomerate of four religious parties in Pakistan, has decided to move the country's Supreme Court against President Pervez Musharraf's announcement that foreign students studying at Pakistani seminaries will be identified and expelled soon. The Alliance described the federal government's decision as a "violation of international human rights". "It is bare violation of international human rights to expel students from country's madarsaas and the rulers are making wrong decisions owing to Western countries' pressure. The step to expel foreign students from Pakistani madarsaas has been taken on foreign masters' pressure and it will leave a negative impression about the role of madarsaas, globally," the Online News quoted MMA deputy parliamentary leader Hafiz Hussain as saying in an interview. Hussain further said that either the SC should take suo motto notice of the government's decision, else the organisation would approach the Apex Court challenging it. The Pakistan government's decision was taken in the wake of reports that at least four of the five 7/7 London bombers were Britons of Pakistani origin, and that the Islamic fundamentalists at Pakistani madarsaas had "influenced" their minds towards taking to terror activities. “We have carried out search warrants at two addresses in the Sussex area in connection with July 21,” a spokeswoman for London’s Metropolitan police said, adding that the officers making the arrests were not armed. She said the suspects were arrested under Britain’s anti-terrorism law but no further information was released about their alleged roles in the failed bombings, in which four suspected Islamic extremists attempted to blow up three underground trains and a bus in London. “Searches of the premises are ongoing. No armed officers are present,” she said. The July 21 incidents, in which no one was injured because the bombs failed to fully explode, were an attempted repeat of the deadly July 7 attacks in London which killed 56 people, including the four suicide bombers. The girlfriends of two of the suspected London bombers were arrested while allegedly trying to leave the country, a media report said today. The women were trying to board an express train for Stansted airport at the Liverpool Street station when armed anti-terror cops arrested them on Friday, it said. According to security sources, the two were partners of Muktar Said Ibrahim and Ramzi Mohammed, both linked to the failed suicide attacks on underground train stations here on July 21. A bag stuffed with bogus passports, documents and bank cards was found abandoned at London’s Heathrow Airport, a British news weekly said today. The 19 passports inside were for Indian, Pakistani, British, Nepalese and South African nationals. ‘The News of the World’ called the find a “potential terrorist goldmine” and said anti-terrorist officers were urgently probing the discovery. The bag was spotted by a taxi driver on a verge near London’s main airport on Thursday, the day before three of the four July 21 attempted suicide bomber suspects were arrested. However, security agencies have begun hunting for an Al-Qaida mastermind believed to be behind the recruitment and training of both sets of London bombers. Osman has revealed that the suspects watched hours of TV footage showing grief-stricken Iraqi widows and children alongside images of civilians killed in the conflict. He is alleged to have told prosecutors that after watching the footage, “there was a feeling of hatred and a conviction that it was necessary to give a signal — to do something,” ‘The Sunday Observer’ reported today. He claimed that the bombers were led by Mukhtar Said-Ibrahim, the bus bomber, who was arrested in London on Friday. CHILDREN as young as 11 are being targeted by radical Muslims who appear to have infiltrated a mainstream Muslim website, The Independent on Sunday can reveal. Literature aimed at children between 11 and 18 on the youth section of the Islamic Society of Britain (ISB) website calls on them to "boycott those who openly wage war against Allah". The article containing that quote, entitled "Imam Hassan al-Banna on jihad", goes on to say: "Jihad is a powerful invigorating yearning for Islam's might and glory ... which makes you cry when looking at the weakness of Muslims today and the humiliating tragedies crushing him to death everywhere. "Jihad is to be a soldier for Allah. When the bugle calls ... you should be the first to answer the call to join the ranks for jihad." Other articles on atheism and secularism appear to be against integration. One article is entitled "Zionism, a black historical record", and another, "Israel simply has no right to exist". The ISB immediately disowned this content after being informed of it by the IoS, and promised to remove it. — By arrangement with The Independent, London. A car bomb exploded at an Iraqi police checkpoint south of Baghdad today, killing seven persons and wounding 12, the police said. The attack occurred around 50 km south of Baghdad, near the town of Haswa, the police department here said. The explosives-laden vehicle had been left by the side of the road, near the checkpoint, and was detonated through a remote-controlled device. All of those killed were civilians, the police said. Three of the wounded were policemen. The Iraqi police and army checkpoints are frequently targeted by insurgents, who see Iraqi security forces as allied to US-led forces and dismiss them as collaborators. The area south of Baghdad, in and around Hilla, has been dubbed “the triangle of death” by US forces because of the frequency of insurgent attacks. Iraqi forces have set up multiple checkpoints in the area to try to stem violence. Five US soldiers were killed by roadside bombs in two separate incidents in Baghdad, the US military said today. In the first attack early yesterday, a patrol hit a roadside bomb in the southern Dora neighbourhood, killing a soldier from Task Force Baghdad, a statement said. Two others were wounded in that incident.